LG OLED55B8PLA review | What Hi-Fi? We’re not so detached from the real world we would ever suggest £2000 is ‘cheap’ for a TV. After all, we live in an era in which you can buy a big 4K TV for well under £1000. The truth is, though, that £2000 is a very attractive price for an OLED television from the masters of the art, LG. 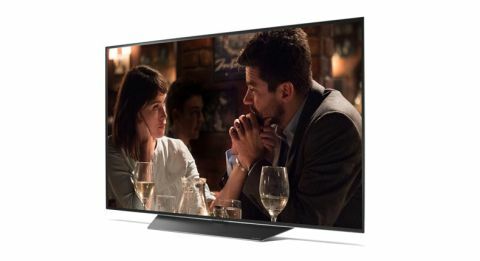 What's more, we're well beyond the point at which you'd need to pay the full list price to get this, the 55in LG B8 OLED (LG OLED55B8PLA) into your home: between now and its inevitable discontinuation, £1300 is the most you're likely to have to find. LG’s more expensive 2018 models - the W8, G8, E8 and C8 - all benefit from the new Alpha 9 processor, which promises (and delivers, in our experience) improvements in noise reduction, sharpness, depth enhancement and colour reproduction. While the B8 gets the same OLED panel as its siblings, is does have to settle for the Alpha 7 processor of LG’s 2017 OLEDs in order to hit its lower price point. The eagle-eyed among you might have spotted an LG OLED55B8SLC available with some retailers. LG tells us the differences between the two sets are the stand design (Alpine on the 'PLA' versus Crescent on the 'SLC'), the speaker configuration (2.2 versus 2.0) and power output (40W versus 20W). Once up and running, there's very little sense of any actual 'settling' going on - the OLED55B8PLA is one of the most pound-for-pound impressive TVs currently available. We head straight to Alex Garland’s excellent sci-fi thriller Annihilation on Netflix (it's a film we strongly recommend) and the picture we are met with is as welcome as the greeting from an old friend. The lush greens of ‘The Shimmer’ world and the more muted khaki tones of the army uniforms come through with familiar richness and refinement. The LG is not only a natural with tones but also in its handling of shading - its colour reproduction as grounded as the B8’s feet are to the stand on which it sits. The 55in C8 and E8 TVs we’ve already seen this year bring a touch more sharpness, as well as transparency in terms of both colour and detail, thanks to their next-gen processor - but it’s not leaps and bounds compared with the B8. Even with non-HDR content, the B8 is impressively sharp, clear and bright too - although second-best in those respects compared with Samsung’s QE55Q9FN and QE55Q8DN, whose QLED technology drives for outright clarity and brightness levels. This means white surgical gowns are brighter, water has an extra glisten, and details in darker scenes are more obvious on the Samsungs than this (or any) LG. When ‘The Shimmer’ erupts into a fireball, filling the screen, you can appreciate the Samsungs’ peak intensity over the LG, too. The Samsungs don’t quite cause the reaction of a deer in the headlights (thankfully), but they grab your eye in the same way a ‘50% sale’ sign does - and they are also very good in bright rooms. But the LG responds with its marginally richer colours and improved shading. As the women wade through the swamp, it’s better at discerning different lighting in parts shaded or uncovered by the overhanging growths – making things look more realistic and better communicating a sense of depth. This is an OLED TV, of course - so black levels plunge deeper too. And we like the LG’s easier-on-the-eye refinement. Image stability isn’t a problem for the B8 either. We move from dystopian Special Forces (via streaming) to the armies of World War II in Dunkirk via Ultra HD Blu-ray, and the soldiers in the background on the beach remain well outlined as the plane passes over them in the foreground. We bump the LG’s custom 'TruMotion' blur and de-judder settings up slightly – especially during streaming – but applying things too heavily (or selecting the ‘Clear’ mode) causes a glassy effect that makes it look like the processing is, detrimentally, overcompensating. You may prefer motion settings off altogether – it’s worth experimenting. Of course, having strong blacks without the insight to expose the detail within them is about as much use as a mime performing in front of a black and white striped background. Thankfully, there’s lashings of detail between the black bars not only in bright daylight scenes but also in darker moments. So, when Harry Styles et al are underneath the boat, you can make out hair strands in the array of black mops. It’s one of the many ways the LG makes the most of the disc’s 4K HDR presentation. The transparency to make clear the content’s leap in both resolution and colour range is there in spades. If you have invested, or plan to invest, in Ultra HD Blu-ray, we can’t imagine you’ll be disappointed watching it through this LG. Of course, in an ideal world you want a decent sound system to accompany your £2000 TV. By the generally poor standards of TV speakers, the B8’s sound is fairly impressive. While the Samsung QE55Q8DN is clearer and goes louder, the LG can again counter its rival - this time with greater weight and solidity. In Dunkirk there’s substance to machinery, planes and explosions. And with The Grand Tour, Jeremy Clarkson’s narration possesses its familiarly thick qualities, while car revs and tyre screeches sound dramatic. This LG is able to make more of the background music, too. In the sound menu you’ll see the ‘Adaptive Sound Control’ mode, which we keep on as we find it fleshes out the sound whether we watch the BBC News at One or Clarkson and co via Amazon Prime Video. Such video streaming services are easily located within LG’s webOS smart platform, which provides a seamless and intuitive user experience. This year, it’s been beefed up with LG’s ThinQ AI smarts, allowing voice control of TV and connection functionality. For example, you can ask the TV to turn on or off, search for specific content (by name or starred actor for example), or switch picture modes without having to navigate menus. The LG B8 now also has Google Assistant support, expanding voice control to functions outside TV. So by pressing the microphone button on the remote, you can check weather, ask general questions and control Assistant-compatible home devices such as lights and thermostats. Back to TV-watching features and, while HDR10 compatibility is routine these days, the LG goes the extra mile to incorporate HLG, Dolby Vision and Advanced HDR by Technicolor. The LG also supports High Frames Rates (HFR) up to 120fps, however, as with 2018 sets from Sony, Samsung and Panasonic, its HDMI inputs (of which there are four) meet only the HDMI 2.0 standard, rather than the HDMI 2.1 spec needed to pass through 4K, HFR and HDR over HDMI. That means the LG B8 will be able to support such content only through built-in apps (such as Amazon or Netflix), although note that its Alpha 7 processor can output either HDR or HFR at any one time, not both simultaneously. It’s a bit of a moot point at the moment, anyway, as there isn’t really any HFR content available, so it shouldn’t be a cause of contention for a while - who knows, maybe until you’re next ready to upgrade your TV. MORE: HDR10 v Dolby Vision HDR - which is better? For those considering an upgrade to their TV now, there’s some significant weighing up to do (or, perhaps, a game of rock/paper/scissors to play). If you thought it was tough choosing a favourite child, try picking between the handful of five-star OLED TVs we’ve seen so far this year. But here’s some food for thought: while the newer LG processor in the next model up - the OLED55C8PLA - does bring picture improvements, they are evolutionary rather than revolutionary, meaning those on a stricter budget may well find the better value comes in the shape of this OLED55B8PLA.